Thank goodness basketball season is almost here. 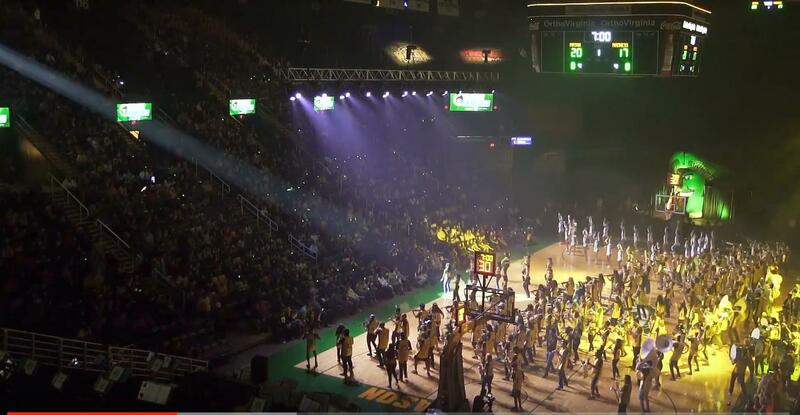 Each fall the Green Machine helps get the student body hyped for the basketball season at a tip off event called Mason Madness where the band, team, cheerleaders and dance team are featured together. A lot of schools do these types of events, but no one does it quite like GMU. And that's because no one has the Green Machine. Under the direction of the famous Doc Nix, the Green Machine is a power house pep band that is open to all students at GMU, yes even string players and well any other instrument honestly. Doc Nix's mindset is if you can play then you should be in our band. We love it. The result is a funktastic, energetic and incredibly supportive pep band that makes some serious music at games. They even performed with Lady Antebellum last year! The team and coaches love them and we have even sent band haters to their games to convert them into band lovers. Check that story out here. Their performance this year at the tip off event is a blast to watch and if you love fun pep bands then you will fall in love with the George Mason Green Machine. Can't wait to visit for a game!